I first started looking for second great grandma Mary Farrar in 1966, knowing very little about her other than her possible name. She was born on the far northern border of New Hampshire in the 1820's to Seth and Azubah Chandler Tirrill. My mother found one of my fathers cousins in California by mailing letters to everyone in and around Calaveras county with our surname asking if they were related. We had relatives! You see, my grandfather left Calaveras county as a teen and never returned home. Two of his sisters visited he and grandmother once before he died at the age of 37 and the verbally passed down memory was the only information we had about his parents family. No knowledge. Who were our people? We only had the few memories and a couple names that my grandmother had jotted down in an old book. The letters from our California cousin were a godsend. She had become the 'historian' for her generation and although her records were somewhat sparse, she had names, places, dates and lots of stories about our ancestry that were pregnant with clues. My mother started the search first and because I was attending college, working full time and dating my future wife was of little help in the quest. She made a little headway but found many brick walls that severely impeded progress. A few years passed and I took up the quest. Surely, I could find information about Mary Tirrill Farrar's lineage. I'd learned to navigate large college libraries and had sort of grown up doing research in the Family History Library in Salt Lake City. Eventually, the wall started to crumble and I found my Tirrill lineage, but still only knew Mary's birth year and place. She was still a mystery to me. One Friday night after going to dinner with our friends, I convinced them to stop at the college library, ostensibly so I could teach our friend how to find and use the genealogy collect there for her own research, but in reality, so I could look through the books, one more time. Our friend quickly found books about her family and I left them engrossed reading them while I dragged my finger across the spines of the books while walking up and down the aisle. A systemic search method? No, but I'd learned to listen to other promptings when I'd tried everything I else. Click. Click. Click. Wait! What was that? A book called "History of the Town of Bristol, Grafton County, New Hampshire. Volume II - Genealogies". Taking the book off the shelf, I sat down in the aisle to peruse its pages. Bristol, New Hampshire is about 120 miles south of where grandma Mary grew up, so what was I doing other than being a genealogy geek reading a book that only others of my ilk could love? Chandler! The Chandler family was listed in the book. Mary's mother was a Chandler. Abiel Chandler? That was Azubah Chandler's fathers name. Turning the page, I found him listed as a married man. His children's names were listed too. Quickly scanning down the page, I found Azubah who married Seth Tirrill. Immediately below them was listed their oldest child, Mary Adrith Tirrill, b. Stewartstown; m. Thos Farrar, d. Walworth Wis. Four children.!! I couldn't believe what I was seeing after all the years of searching. A clue. Maybe even the truth about what happened to grandma Mary Adrith Tirrill Farrar. The hard won clues gathered through years of research started to come together. Mary had apparently left Stewartstown, New Hampshire and traveled south for some reason. She met a young recent immigrant from England named Thomas Farrar and they married. They had four children! I knew of only two, my great grandmother, Helen Mary Farrar Drew and her sister Julia. Two years passed as I continued searching for any information about Mary's death date and Helen's birth records with no success. Once again, out of clues or ideas, I was dragging my finger across the spines of the books at the Family History Library. Click, click. I stopped at a volume with a yellow binding. The 1850 federal census of Lexington County, South Carolina? Give me a break..... But I'd learned to listen to the feelings and sat down with the book not knowing what would turn up. Farrar, John, his wife and children were listed. Living with them were Thomas and "Edith" Farrar. He born in England. She born in New Hampshire. Edith! She was obviously using her middle name. Adrith = Edith. Score! They had their first child, grandma Helen, in May 1851 and apparently left South Carolina looking for better economic opportunity. 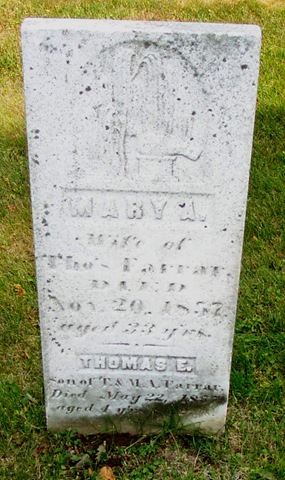 Twenty years later, the Walworth County Genealogical Society inventoried the Brick Church Cemetery located a few miles northwest of Walworth and published a book listing all the burials in it. I happened to be in the Family History Library the day it was put on the shelves as a new purchase. It was almost time for the library to close and as is my want, I often end the day walking through the aisles of books. Click. Click. The Brick Church Cemetery book almost leapt into my hands. There they were. There was grandma Mary, her son, Thomas Jr., her mother-in-law, Elizabeth and her husband Thomas? Wait. What? Thomas went to California and took his two daughters with him. He wasn't buried there. I wrote an email to the Walworth Genealogical Society and asked if anyone would go take photos of the headstones for me. I needed to read the inscriptions for myself. A note came back the next day saying that if I would pay for the gas, this fine lady would take digital photos and send them to me. I couldn't write a check fast enough. A week later, I was looking at the photo of grandma Mary's headstone. She died as a fairly young woman in Nov. 1857. Her son died as a young child in May 1857. Her mother-in-law died in July 1857. The headstones stood adjacent to each other. A nephew's stone was two spaces to the right. The empty space was in the name of Grandpa Thomas Farrar. No wonder he left the area. He lost most of his loved ones in a matter of months. Finally! I had found them, 35 years after I started looking for them in earnest, all because of a book about the genealogies of residents in a town 120 miles south of where I expected to find information or clues. When you think you've exhausted every possible avenue of research, don't forget to look through books of towns in the area. These town history books were commonly written in the second half of the 1800's and early 1900's and are wonderful resources. You too may find GOLD in them. If all else fails, walking down aisles of historical books dragging a finger may not hurt too! Click. Click.